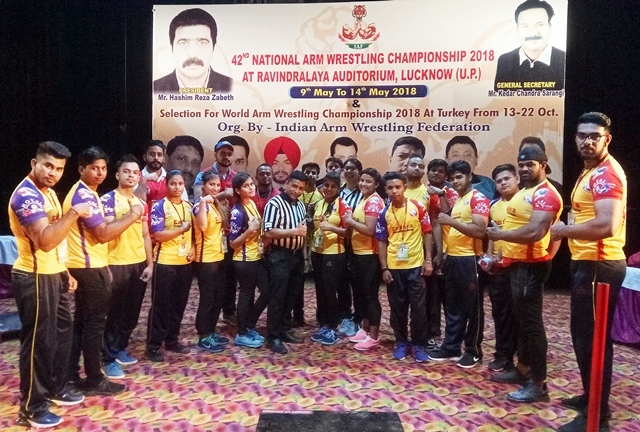 Armwrestling Association of New Delhi’s General Secretary and coach Laxman Singh Bhandari told that Delhi Team won 12 medals in the 42nd National Arm Wrestling Championship 2018 held at Ravindralya Auditorium, Lucknow, UP from 9-14 May 2018. There are 350 participants from 23 States have participated in this championship. 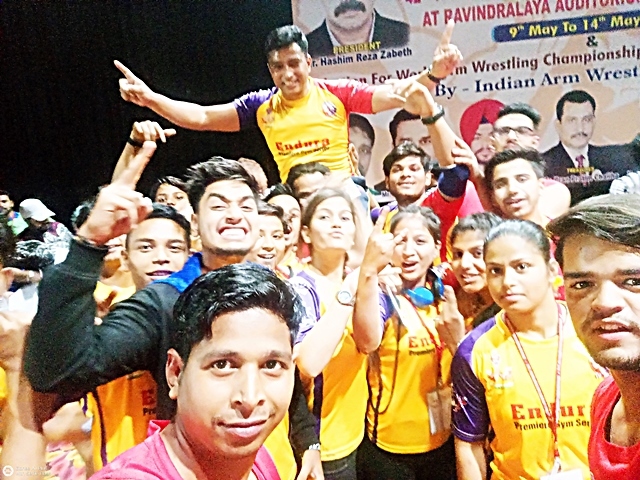 Sandeep Singh 65kg, Sahil Datta 110kg, Ankur Datta 110+kg Bronze Medal in the Right Hand Senior men, Karan Thakur 55kg & Nayan Bora 70kg Bronze Medal in Senior Left Hand, Samardeep Singh 70kg, Ayush Tripathi 75kg Silver medal and Nawal Kishor 80+ Bronze Medal in Youth Boys Left hand, Sidra Ali Khan 50kg Bronze Medal in Left Youth Girl, Youth Girl, Shruti Bawa 80+kg Gold in Youth Right Hand, Chesta Makhan 55kg Bronze Medal Women Left Hand, Laxman Singh Bhandari 70kg Gold Medal in Master Right Hand category, Surender Kumar and Ishmeet Kaur participated Referee from Delhi. Gold and Silver medal winners got the selection for World Arm Wrestling Championship 2018 from 13-21 Oct in Turkey, Antalya. All the Delhi association members President Sunil Mahajan, Chairman Ravindra Gupta, Roshan Lal Gorakhpuria, Satish Jindal, Dr. Rajiv Prashar, Charanjeet Budhiraja, Rajender Adhikari, Harpreet Singh Sethi, Abhishek Adhalakha and many other officials give best wishes to Delhi team.